Welcome to Day 24, the last day of our LEGO Advent Calendar countdown. Each day, we’ve revealed the three mini-builds from the LEGO Star Wars, LEGO Friends, and LEGO City 2018 advent calendars along with commentary from The Brothers Brick team. If you’re opening one (or more) of these advent calendars along with us, we’ve made sure the pictures and commentary on each day’s models will be behind a jump so we don’t accidentally ruin the surprise. What will we score for Day 24, the final day? Click to reveal today’s final LEGO advent calendar builds! Welcome to Day 23 of our LEGO Advent Calendar countdown. Each day, we’ll reveal the three mini-builds from the LEGO Star Wars, LEGO Friends, and LEGO City 2018 advent calendars along with commentary from The Brothers Brick team. If you’re opening one (or more) of these advent calendars along with us, we’ve made sure the pictures and commentary on each day’s models will be behind a jump so we don’t accidentally ruin the surprise. What holiday glee will come from Day 23? Click to reveal today’s LEGO advent calendar builds! Welcome to Day 22 of our LEGO Advent Calendar countdown. Each day, we’ll reveal the three mini-builds from the LEGO Star Wars, LEGO Friends, and LEGO City 2018 advent calendars along with commentary from The Brothers Brick team. If you’re opening one (or more) of these advent calendars along with us, we’ve made sure the pictures and commentary on each day’s models will be behind a jump so we don’t accidentally ruin the surprise. Will we get something new for Day 22? 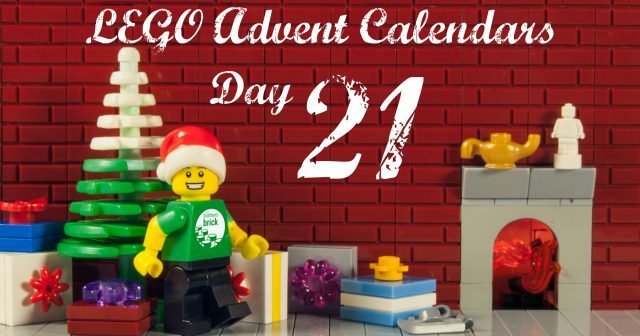 Welcome to Day 21 of our LEGO Advent Calendar countdown. Each day, we’ll reveal the three mini-builds from the LEGO Star Wars, LEGO Friends, and LEGO City 2018 advent calendars along with commentary from The Brothers Brick team. If you’re opening one (or more) of these advent calendars along with us, we’ve made sure the pictures and commentary on each day’s models will be behind a jump so we don’t accidentally ruin the surprise. Will Day 21 be fun? Welcome to Day 20 of our LEGO Advent Calendar countdown. Each day, we’ll reveal the three mini-builds from the LEGO Star Wars, LEGO Friends, and LEGO City 2018 advent calendars along with commentary from The Brothers Brick team. If you’re opening one (or more) of these advent calendars along with us, we’ve made sure the pictures and commentary on each day’s models will be behind a jump so we don’t accidentally ruin the surprise. Will Day 20 be the best day yet? Welcome to Day 19 of our LEGO Advent Calendar countdown. Each day, we’ll reveal the three mini-builds from the LEGO Star Wars, LEGO Friends, and LEGO City 2018 advent calendars along with commentary from The Brothers Brick team. If you’re opening one (or more) of these advent calendars along with us, we’ve made sure the pictures and commentary on each day’s models will be behind a jump so we don’t accidentally ruin the surprise. What does Day 19 have to surprise us? Welcome to Day 18 of our LEGO Advent Calendar countdown. Each day, we’ll reveal the three mini-builds from the LEGO Star Wars, LEGO Friends, and LEGO City 2018 advent calendars along with commentary from The Brothers Brick team. If you’re opening one (or more) of these advent calendars along with us, we’ve made sure the pictures and commentary on each day’s models will be behind a jump so we don’t accidentally ruin the surprise. Will Day 18 be the best day yet? Welcome to Day 17 of our LEGO Advent Calendar countdown. Each day, we’ll reveal the three mini-builds from the LEGO Star Wars, LEGO Friends, and LEGO City 2018 advent calendars along with commentary from The Brothers Brick team. If you’re opening one (or more) of these advent calendars along with us, we’ve made sure the pictures and commentary on each day’s models will be behind a jump so we don’t accidentally ruin the surprise. What does Day 17 have in store? Welcome to Day 16 of our LEGO Advent Calendar countdown. Each day, we’ll reveal the three mini-builds from the LEGO Star Wars, LEGO Friends, and LEGO City 2018 advent calendars along with commentary from The Brothers Brick team. If you’re opening one (or more) of these advent calendars along with us, we’ve made sure the pictures and commentary on each day’s models will be behind a jump so we don’t accidentally ruin the surprise. Will we deem Day 16 keen? Click to reveal today’s LEGO advent calendar builds! Welcome to Day 15 of our LEGO Advent Calendar countdown. Each day, we’ll reveal the three mini-builds from the LEGO Star Wars, LEGO Friends, and LEGO City 2018 advent calendars along with commentary from The Brothers Brick team. If you’re opening one (or more) of these advent calendars along with us, we’ve made sure the pictures and commentary on each day’s models will be behind a jump so we don’t accidentally ruin the surprise. Will we be thrilled with what we build on Day 15? Click to reveal today’s LEGO advent calendar builds! Welcome to Day 14 of our LEGO Advent Calendar countdown. Each day, we’ll reveal the three mini-builds from the LEGO Star Wars, LEGO Friends, and LEGO City 2018 advent calendars along with commentary from The Brothers Brick team. If you’re opening one (or more) of these advent calendars along with us, we’ve made sure the pictures and commentary on each day’s models will be behind a jump so we don’t accidentally ruin the surprise. What pint-size surprises will be in Day 14’s prizes? Click to reveal today’s LEGO advent calendar builds! Welcome to Day 13 of our LEGO Advent Calendar countdown. Each day, we’ll reveal the three mini-builds from the LEGO Star Wars, LEGO Friends, and LEGO City 2018 advent calendars along with commentary from The Brothers Brick team. If you’re opening one (or more) of these advent calendars along with us, we’ve made sure the pictures and commentary on each day’s models will be behind a jump so we don’t accidentally ruin the surprise. Will Day 13 be routine? Click to reveal today’s LEGO advent calendar builds!